The size of the field and the size of the goals may be reduced for youth games. Games may not be played if the goals are not properly secured. Goals must match in size and construction. The minimum lines for a game to be played may be: Touch Lines, Goal Lines, Penalty Area, Halfway Line. Ball sizes may be smaller than Size 5 for youth players. The number of players may be fewer than eleven for youth games. Maximums and minimums may be established by age group. Girls may play on boys’ teams, but boys may not play on girl’s teams. Substitution and return substitution (resubstitution) may be limited or unlimited. Substitutions may be made only at certain times. The potential number of substitutes available may be modified. No substitutions may be made in the last one-minute of play. Equipment may be modified for youth games. No metal or screw-in cleats are allowed; molded rubber or plastic cleats only. Shinguards must always be fully covered by socks, even if the socks fall down during play. Socks may be held up by garters, tape, or stocking ties of any color as long as the top of the socks are folded over them. No metal-ribbed shinguards are allowed; plastic, hard rubber, and cloth only. No electronic performance and tracking system (EPTS) devices may be allowed. Sports glasses (sports goggles, wraparounds, sports “spectacles”) with soft, flexible frames and polycarbonate lenses are allowed as long as they are securely attached to the head. Spectacle guards are not permitted. Undergarments for warmth may be worn in cold weather; undergarments do not need to match the colors of the shirt, shorts or socks as long as the shirt, shorts or socks are worn on the outside of the undergarments and are clearly visible. Soft knit caps and gloves are permitted. Jerseys are expected to have numbers that are unique to each player. “Inside the ear” hearing aids are permitted. External orthodontic devices are not permitted. Designated “home” teams are expected to change jerseys if there is a color conflict. It is the intention to get games played. If jersey numbering and color conflicts cannot be resolved, “pinnies” may be used or the game played with agreement of the coaches. Nothing “foreign” may be in the mouth, other than internal orthodontic devices. This includes, ice, gum, and lozenges. Mouth guards are permitted. Casts, splints, and knee braces are permitted, as long as they are wrapped and padded and approved by the referee. No exposed metal or sharp edges are permitted. “Medical Alert” bracelets and necklaces are permitted if they are sufficiently padded and the information shows. Use of Signals: For instructional purposes, referees may be asked to provide more details on their calls. Referees are to use hand signals and announce verbally to identify both the type of foul and the direction of the kick. See Law 12 regarding the implementation of temporary dismissals (“Sin Bins”). Referees may, at their discretion, use volunteer Assistant Referees (linesmen) to call ball in and out of play. For all games officiated by one referee, each team is required to make one club linesman available. If volunteer Assistant Referees are used, they may only call Goal Line and Touch Line outs (not offside, or goals). Youth games may have shorter durations. Halftime intervals may be reduced. Play may be stopped due to outside interference such as dogs, siblings, parents, and balls striking overhanging tree branches. If one team had clear possession of the ball when play was stopped within the field of play, for an injury or unusual event (e.g., loose dog), play will be restarted by that team with an indirect free kick. If the ball hits an overhanging tree branch, play shall be restarted with a dropped ball. 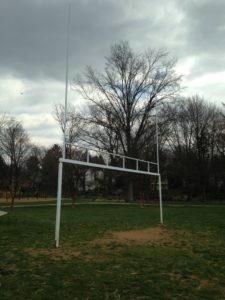 On fields that use combination American football/soccer goals, if the ball strikes any portion of the American football posts, it is immediately out of play. Play shall be restarted based on what would have transpired had the posts not been in place, i.e., corner kick or goal kick. Parents and fans are required to stay at least three-feet away from the touchlines. No coaches, parents, or fans are allowed behind the goal or the goal-lines. Games may be modified for “straight running time.” This is usually the case where recreation games are played on a tight schedule, one right after the other. There will be no Added Time, Extra Time or penalty kicks. Offside may be modified based on the age group involved. Only flagrant offside violations will be called in U-9 and below recreation games. No offside shall be called in instructional games. Handling may be modified for pubescent girls and women. Girls in all programs U-14 and below will not be penalized for Handling if they perform proper technique for protection of the chest. Proper technique involves crossing the arms and holding them tightly to the chest. Moving the arms away from the chest to propel or influence the path of the ball is to be called for Handling. Goalkeepers may receive additional protection. A goalkeeper may not be charged while in possession of the ball. Youth goalkeepers may be allowed discretion in placing the ball back into play after gaining possession. Only flagrant violations will be called in U-9 and below recreation games. Unruly fans may be ejected from youth games for misbehavior. Spectators or other team fans or supporters are to be controlled by the Coach. Spectators who do not maintain appropriate decorum shall be ejected from the grounds by the coach after having been told to do so by the Referee. At their discretion, the Referee(s) may terminate the match if the person (or persons) does not leave the grounds and continues to misbehave. Coaches and team officials may be shown yellow and red cards for misconduct. each player shall also sit out at the team bench for eight (8) minutes. The throw-in procedure may be modified in order to keep games moving. Improper throw-ins may be retaken once in U-9 and below recreation games before going to the other team. Local Rules may also include “Mercy Rules” or actions designed to keep teams from scoring so many goals, almost always associated with youth recreational games, as to demoralize players or make them want to stop playing the game. Any undefined soccer words, terms, or phrases may be found in The ULTIMATE SOCCER DICTIONARY of American Terms available at Amazon.com .